Originally the US Army allocated direct support howitzer weapons at the rate of three per tank battalion in the form of either halftracks or M7 “Priest” HMC vehicles. But as the war progressed and units were called on to carry out direct support at small arms ranges, the decision was made to switch to mounting a small 105mm howitzer in the M4 chassis. Externally these tanks looked just like a normal Sherman with the exception of the different mantelet and rotor assembly and of course the thick, stubby gun barrel. Internally the tanks were rearranged, and while initial production models with the VVSS suspension did not have power traverse it was quickly reintroduced after complaints from the field. Also, early tanks had the old split-cover hatch for the commander with the new oval loader’s hatch. 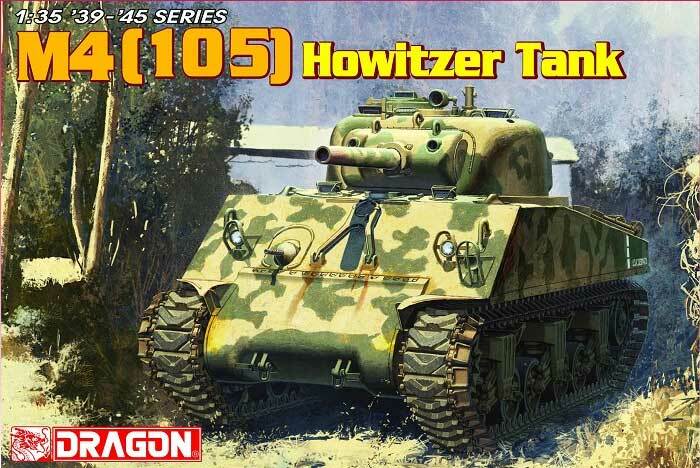 Due to priority for the so-called “vision” cupola to go to the “gun” tanks, it was not until the summer of 1944 that the howitzer tanks began to receive them. Photographic evidence is hard to evaluate, as it appears in some cases either an early tank was updated or a later one swapped out the vision cupola for the split-hatch version as tanks with a variety of features can be seen in photos. Later production tanks had the new HVSS suspension, and the last group to be built also added fittings for a canvas mantelet cover along with that cover. The Marine Corps in the Pacific also had a modified version that added a flamethrower, dubbed the POA-CWS-H5. In Korea, the USMC used both that vehicle and a regular M4A3 (105mm) but also fitted with an M1A1 dozer blade. The US Army took delivery of 1,641 M4 (105mm) (800 with VVSS and 841 with HVSS) tanks and the UK received 593 M4 (105mm) tanks. 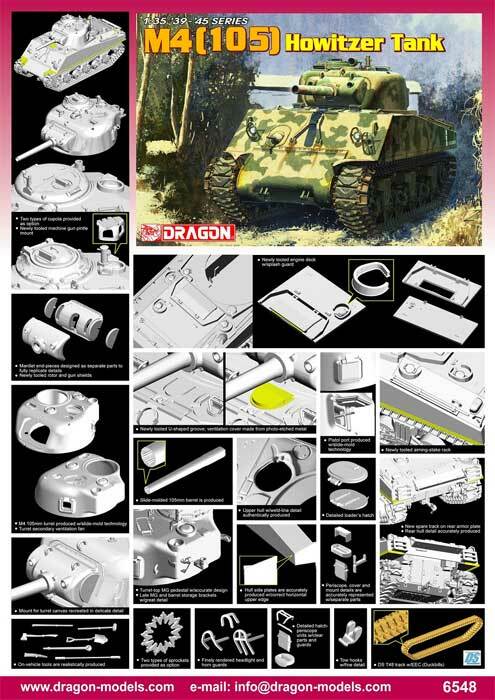 An earlier DML M4A3 (105) kit came with HVSS (No. 6354) but was noted as having a mantlet which copied the 1/72 scale kits’ too narrow mantlet, which was a shame as it threw off the proportions of the turret. This kit of the earlier variant now comes with a correctly scaled mantlet (e.g. 29.4 mm wide), so the older option of either buying an after-market item or borrowing one from the elderly DML POW-H5 flamethrower tank is no longer needed. This kit comes with a new mold upper hull and parts from the M4 Pacific Theater of Operations and M4 Direct Vision kits as appropriate. New equipment rails and first-aid kit come with the turret. The turret has the “bulge” on the right front but there is a small seam which will need to be addressed. All of the periscopes and their mounts are separate parts as well. Both the split hatch and vision hatch commander’s cupolas are provided as is the nicely done DML M2HB AA machine gun with “Slide Molded” muzzle. All viewers are clear styrene, as are all lights. This kit now comes with a relatively complete selection of suspension components, offering both the “flat top/riser” and “lifted” return roller mountings, separate track skids with bolt details, and a choice of either “spoke” or “cast” style welded wheels. It also offered both “machined” and “smooth” types of driver tooth rings. Single-piece T48 track with extended end connectors are also provided as DS Plastic parts. Technical assistance was provided by Pawel Krupowicz. The kit provides markings for three tanks: 8th Tank Battalion, 4th Armored Division, Normandy 1944 (tactical markings with two-tone camouflage); 31st Armored Regiment, 7th Armored Division, Normandy 1944 (OD with white stars, B-19); and HQ company, 32nd Armored Regiment, 3rd Armored Division, Belgium 1945 (whitewash over OD). A “number jungle” and set of targeted decals from Cartograf are included. Overall this is a nice kit, and in this case it is reassuring that DML does listen to complaints and suggestions to improve their kits.